The evolution of the Hubble sequence is still a matter of debated. Recently, a series of work from a group leading by François Hammer at Paris Observatories reveal that the Hubble sequence six billion years ago was very different from the one that astronomers see today. Probably gas-rich major mergers of galaxies at that epoch dominated the evolution. This result has been reported by all the astrophysical journals, as well as Nature journal. Via Sino-French international lab, LIA "Origins", Yanbin Yang, a young associate researcher at NAOC, participates in this serials of work, and did a significant contribution to the researches on 2D kinematics(IFU), morphology classification and the numerical simulations of galaxy collision. Figure 1 shows the galaxy morphology in the local universe (top panel, local galaxies) and those six billion years ago (bottom panel, distant galaxies). The sample of distant galaxy were selected from GOODS survey by Hubble Space Telescope, while the local sample were selected from SDSS. In the local universe, researchers found that 3 percent of galaxies were elliptical (marked E), 15 percent lenticular (marked S0), 72 percent spiral (marked Sa to Sd, and SBb to SBd) and 10 percent peculiar (marked Pec). They find an absence of number evolution for elliptical and lenticular galaxies by comparing with this two epochs, which strikingly contrasts with the strong evolution of spiral and peculiar galaxies. 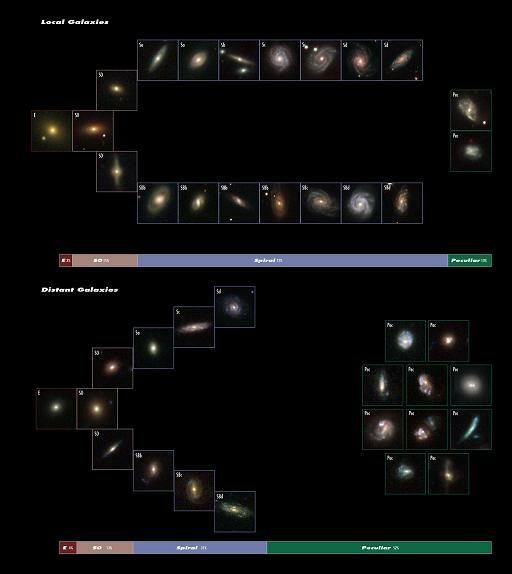 This implies that many of the peculiar galaxies ultimately become large spirals today. At the same time, Hammer is leading a project named "IMAGES" which is designed to study the 2D kinematics of those distant galaxies by IFU observation at VLT/GIRAFFE. According to the "spiral rebuilding" hypothesis, devised by François Hammer, gas-rich galaxy mergers in the earlier universe, especially the major mergers with mass ration less than 4:1, may have played an important role in the evolution processes, and ultimately lead the Hubble sequence that we observed today. By now, they have published 5 papers on the modelling of individual object. Hammer's group is now focusing their efforts on the comprehensive study of the sample, and preparing the detailed modelling for each of them. This may push forward the understanding of galaxy evolution, galactic gas dynamics, as well as star-formation. As deepening of collaboration between China and France, i.e., LIA "Origins", more and more researchers from China will participate in the researches.